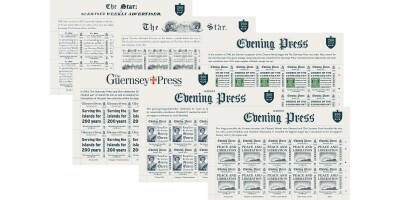 The Guernsey Press and Star, reaches a milestone birthday this year and we have marked the occasion with a commemorative issue that features miniature interpretations of six key front pages from the publication's illustrious past. 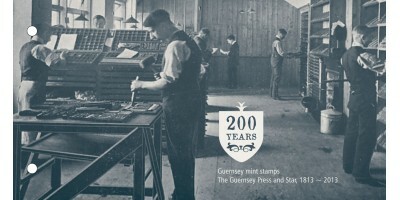 Editor Richard Digard told us: 'We are absolutely delighted that our special anniversary is being marked with this stamp issue, which so absolutely captures the essence and history of our newspaper over the last two centuries'. Dating back to 1813, The Press as it is known locally has become an integral part of island life and along with the postal service, has worked diligently to keep islanders in touch and up-to-date. The two institutions have enjoyed strong links over the years and in the early 20th century they were located across the road from each other in Smith Street, St Peter Port. A pipeline - still thought to exist - ran between them and special tubes carrying telegrams were propelled through it, landing in the editor's tray for the evening paper. In 1940, the Channel Islands were invaded by Germany and occupied for five years. 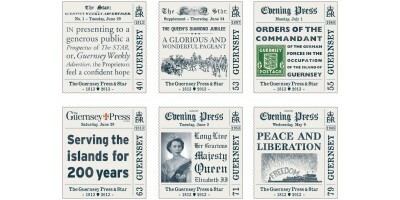 British stamps could no longer be brought into the island and by 1941 stocks ran dry. The General Postal Office - as we then were - commissioned the Press' commercial print department to produce runs of half-shilling and shilling postage stamps. 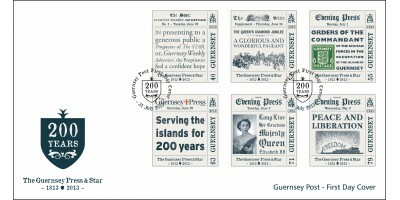 The green 1/2d version is featured in the 55p stamp and recently trod the boards of the world stage on the cover of acclaimed novel 'The Guernsey Literary and Potato Peel Pie Society'.